It’s a little pity to visit Rome by night without indulging in a traditional Italian dinner. This is our solution: a panoramic night tour of the Eternal City including a dinner close to the suggestive Trevi Fountain! It’s a little pity to visit Rome by night without indulging in a traditional Italian dinner! To have the best welcome to Rome, we suggest tasting both its magic mood in the moonlight, and its delicious cuisine. So, we have organized this panoramic and dinner tour, that lets you both discover all the best views of the Eternal City in a different light and enjoy a traditional Italian dinner. After enjoying our pickup service you will reach an elegant restaurant just a few steps away from the monumental Trevi Fountain. After your 3-course dinner, you will have a guided walking tour starting from the enchanting Trevi Fountain, the famous fountain where beautiful Anita Ekberg invites Marcello Mastroianni to join her into Trevi Fountain’s water in Fellini’s movie Dolce Vita. Our local Expert Guide will tell you about the marvellous Trevi Fountain and, of course, you will have the chance to throw a coin over your shoulder into the water, to make sure you will be back in Rome! Our walk continues towards Piazza della Rotonda where you will admire the majestic Pantheon - the best-preserved Roman temple - and learn about the millennial history of this monument. You might recall Brad Pitt and Catherine Zeta-Jones in Ocean’s Twelve! Next, you will see Piazza Navona, a square beloved by the Romans, where you will admire the Fountain of the Four Rivers designed by Bernini and featured in the movie Angels & Demons and many more. After this nice walking tour, you will get on board our motor coach, to enjoy a relaxing panoramic tour and discovering the magical charm of the most famous monuments illuminated at night. 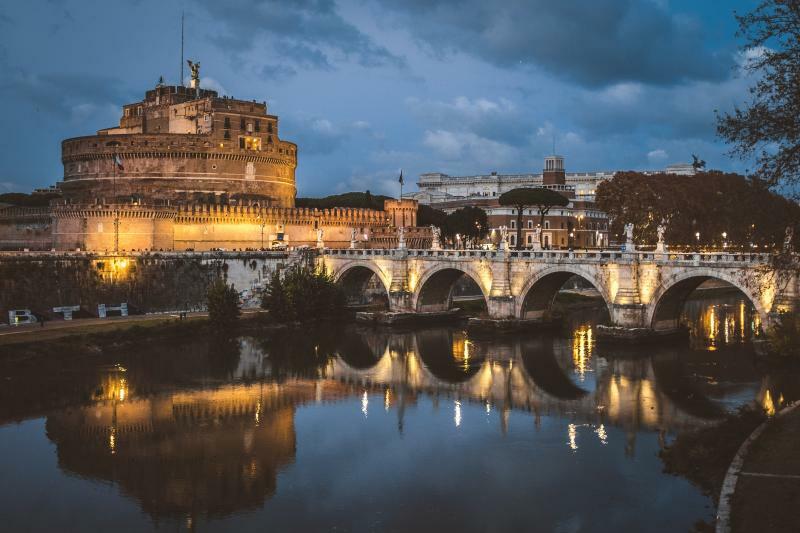 Our expert Local Guide will tell you about Castel Sant’Angelo, originally built as a mausoleum for the emperor Hadrian and then transformed into a safe haven for the Popes thanks to the passageway that connects it directly to the Vatican. or all the Opera Lovers, this is the place where the “Tosca” by Puccini comes to its tragic end. The itinerary continues with St. Peter’s Square, Tiberina Island and The Mouth of Truth, that became a legend after the release of the classic movie Roman Holiday with Gregory Peck and Audrey Hepburn. The coach tour continues overlooking Circus Maximus and the Palatine Hill and it ends with the symbol of Rome: the Colosseum! Take your best pictures where Ridley Scott’s “The Gladiator” was set and BUONANOTTE!